What did you do with the Percocet pills that you didn’t finish after your surgery? Where are they now? Do you lock up your vodka, but leave your Xanax in your bathroom cabinet? Do your kids’ friends know where you keep the ADHD meds? These are some of the questions I came away with yesterday after watching “Out of Reach,” a short documentary starring a teen filmmaker who set out to uncover the growing problem of teens abusing prescription medications — often their parents’ Rxes. It’s part of an initiative by The Partnership at Drugfree.org and CASAColumbia to #EndMedicineAbuse. In fact, the Medicine Abuse Project aims to prevent 500,000 teens from abusing medicine by 2017. What can you do? Lock up your meds, peroperly dispose unused prescriptions, educate yourself and share that information with others, and talk to your kids. Click to pledge to #EndMedicineAbuse by safeguarding your meds and talking to your kids about Rx medicine abuse. Click over to read 5 Signs Your Teen May Be Abusing Medicine. 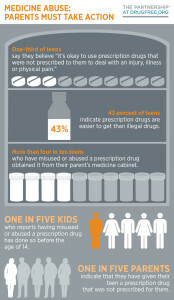 Are Your Teens Taking Your Rx Drugs? The primary long-term danger of drug use is addiction. Addiction is a chronic, progressive brain disease. It’s treatable. Perhaps not as successfully as one might like, but on a par with other chronic diseases that require substantial behavioral change, like diabetes and hypertension. Unfortunately, many people still don’t believe addiction is a disease. That’s why science-based education is so important. For a not-for-profit website that discusses the science of substance use and abuse in accessible English (how alcohol and drugs work in the brain; how addiction develops; why addiction is a chronic, progressive brain disease; what parts of the brain malfunction as a result of substance abuse; how that malfunction skews decision-making and motivation, resulting in addict behaviors; why some get addicted while others don’t; how treatment works; how well treatment works; why relapse is common; what family and friends can do; etc.) please click on http://www.AddictScience.com.